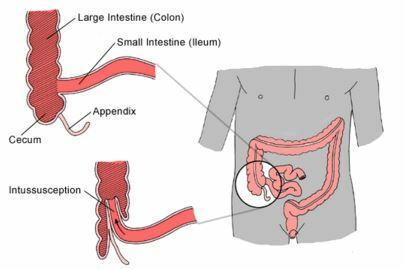 Intussusception is a life threatening condition where the intestine is descending into an adjoining part. This sliding usually obstructs the gastrointestinal tract motility and resultant solid and liquid food content cannot pass through. 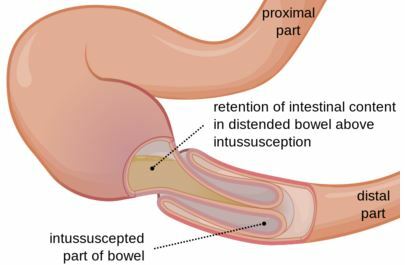 The sliding occurs due to part of the intestine prolapsed within another adjacent fold of intestine, which increases the pressure inside the intestinal wall and leads to inflammation. The affected parts get blood circulation obstruction. In progressive condition, the intestinal tissue become perforated, infected and necrosis occur. The reported case history showed children less than 3 years, mostly affected by this disease rather than adult aged people. The reason of development of intussusception in children is not yet discovered. Doctors reported that underlying cause for adult aged individuals are intestinal tumour. Among all these tests ultrasonography is very commonly conducted for almost every case, as it is trustworthy diagnostic tool and rarely generate false or negative results. Relatively this screening test is cost effective rather than other test. In case of children the probability of risk is less potent and easily approachable. Doughnut sign (Target sign): The manifestation is produced by concentric irregular echogenic and hypoechogenic posses. The echogenic posses are generated by mucosa and muscularis while the submucosa is accountable for the hypoechoic posses. 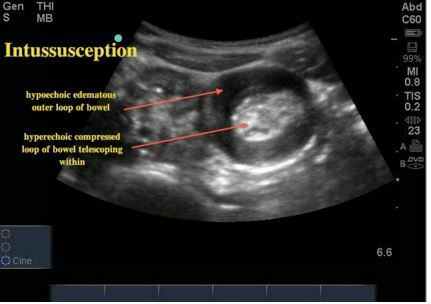 Psedukidney sign: Longitudinal appearance of the intussuscepted subdivision of intestine in ultrasonography indicates this sign. The plump including mesentary which is drawn into the intussusception, enclosed vessels, is significant of the kidney hilum which is produced by the oedematous intestine. Intussusceptions treatment requires medical emergency care, as it leads to severe dehydration and shock. Continuous blockage of blood supply often leads to intestinal infection. Reduction of intestines decompress by nasogastric tube insertion. In this technique, the catheter is inserted into the nose and extends up to the stomach. Barium or air enema. This comprises both investigation and treatment procedure. 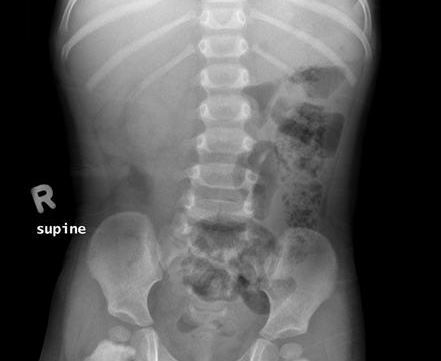 Barium enema or air enema is often effective for children and rarely used for adult patients. At initial application can cure 15-20% and repetition of the technique help to give effective result. It is essential for confirmation of the affectivity of this therapy, as it is not potential for every case. Surgical procedure. If the enema is ineffective for managing the condition then surgery is the only option. Surgery is often recommended for adults and resection and corrects the deformity is considered as an effective treatment. Intussusception is a condition which arises due to segment formation in the intestine. This segment is formed in the intestinal wall. It is associated with pulling of mesentry, blood vessels and nerves in distal segment. This ultimately causes firmness in the veins and swelling occurs in the adjoining area. This leads to obstruction of passage of food and liquid and also reduces the blood circulation to the affected part of the bowel. The usual location for sliding is at the junction of small intestine convenes with large intestine (ileocolic region). Increased firmness in the blood vessels causes hindrance of blood supply in the affected region of the intestine. Continuous obstacles in blood supply cause necrosis of tissues which leads to internal haemorrhages and gangrenous. In advancement of disease condition may causes to abdominal infection and shock.